REPORTS of an assault on a woman hunt saboteur near Leamington are being investigated by police after a video of the incident was shared online. The woman went to hospital with injuries to her face after a row with a hunt supporter who shoved her to the ground before appearing to slap her. The incident occurred on land near the village of Marton on Thursday November 9. 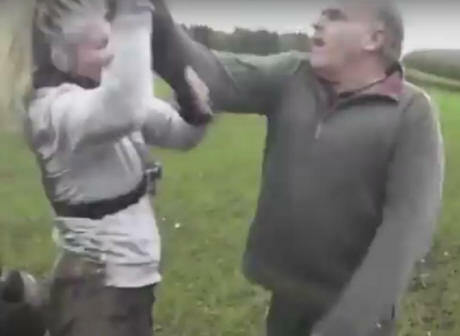 The video, recorded by a member of West Midlands Hunt Saboteurs, shows the woman confronting a man on horseback who says he is hunting rabbits. A man then approaches the woman and her companions, telling them to leave. A split-second clip then appears to show the man raising his hand to the woman’s face. The woman is then seen with a cut above her eyelid. A spokesperson for saboteurs said they were concerned a fox was being hunted, and that the hounds were heading towards a busy main road. And a spokesman for the Hunt Saboteurs Association claimed it was a completely unprovoked attack. A spokesman for The Warwickshire Hunt said: “The Warwickshire Hunt acts within the law to comply with the Hunting Act 2004. Insp Allison Wiggin of Warwickshire Police said: “We are aware that a video of this incident has been shared widely online and has attracted a lot of interest. I would like to reassure people that we will conduct thorough enquiries and speak to everyone involved. Anyone with information can call 101 and quote incident 290 of November 9, or contact Crimestoppers anonymously at www.crimestoppers-uk.org or on 0800 555 111.